You may also e-mail us djwilliams1212@yahoo.com. German Regulator clock, circa - 1890's. 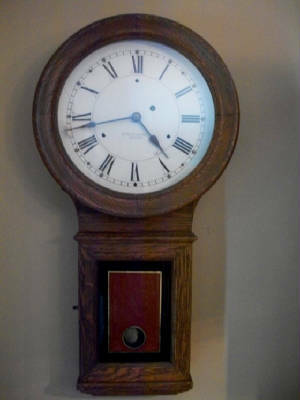 Seth Thomas Regulator clock (medium size), circa - 1880. Seth Thomas Wall Regulator clock (large clock), circa - 1890's. Gustav Lippelt, circa - 1880's. Seikosha 14-Day clock, circa - 1940's. 1943 US Navy Deck clock. mint condition with serial number 12! Contact us at (910) 443-7939 or email for all of your clock, phonograph, and music box needs.